When reminded by my friend, Dave, of the following ATC story, I repeated to him a great quote from the movie Butch Cassidy and the Sundance Kid in which Butch reacts to Sundance’s exhortation to “keep on thinking—that’s what you’re good at,” by responding, “I’ve got vision and the rest of the world wears bifocals.” Interestingly, the character Tony DiNozzo in the TV drama NCIS identified that very quote in an episode in Spring, 2011. Anyway, this story relates to a traffic situation my friend and I shared on a midnight shift one time. 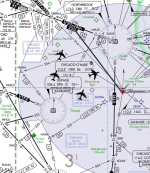 ZMP had handed off a flight of four ORD inbounds out near DSM to Dave working BDF High. They were in a diamond pattern, with one aircraft in front and one in trail, and the other two in between and side by side. At this point the flight is about 250 miles from touchdown. Altitudes are irrelevant—they could have been anywhere from FL330 to FL410. They all would have been at roughly the same Mach and making roughly the same groundspeed. This far out they could have been on their own navigation (with close monitoring) but despite the size of the icons in this image, were probably more than 20 miles apart in every dimension. Dave’s sector was adjacent to mine (I was working PLANO), and we were probably playing some sort of board game in between the sectors, so I was able to see what he had going on. 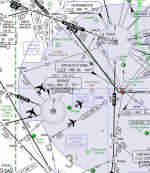 Ordinarily, that is, on the day or swing shift, that pattern of flights would require some sort of ATC intervention—not for separation, although that was a component—but to provide succeeding controllers (me and the guy at ORD) something to work with to ultimately get the airplanes lined up for the runway. What Dave didn’t appreciate (never having worked in the terminal environment), but what I knew (from my time at ORD plus the years of terminal experience working with them), was really two-fold. At this point the aircraft are about 150 miles from touchdown. On day shifts, they’d all be over BDF, down at FL240, and probably indicating something on the order of 320-360 knots (TAS ≈480 knots). 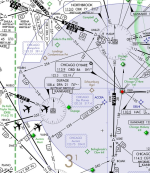 The remainder of each flight’s profile will involve reducing speed and altitude with the ultimate goal of 676' in altitude (field elevation at ORD) and zero speed. Descent is natural in everyone’s thinking, but the speed can always adjusted to our advantage. 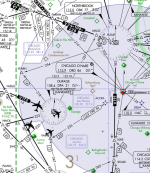 When ORD is on 14R, flights are lined up to shoot an approach from the northwest and land southeast. ORD generally vectored arrivals from the southwest on a 010° or 020° heading to aim the aircraft at a point anywhere from ten to twenty miles northwest of ORD. As they got close to the localizer (the electronic guidance signal to the airport), the controller would turn them successively toward the localizer and then issue approach clearance from which the aircraft would then line up for the runway. In conventional operations (and thinking), such as on the day shift, we would have the airplanes lined up, in trail, one after another, over the approach fix approximately 40 miles (Southwest, in this case) from the airport. The approach controller would then vector them, single file, to line them up for the approach. 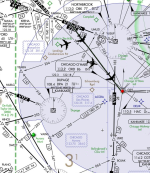 However, the geometry provided with this diamond pattern meant that with respect to the airport and the localizer, it wasn’t really a flight of four—it was two flights of two, and they were already halfway lined up insofar as the approach course was concerned. Dave really had no way of calculating that (not because he wasn’t sharp—he was—he just didn’t have terminal arrival experience). Following is a series of images that show how the flights might look as described below. Since they are always geographically separated, they all could have been descended as low as 3,000 from 100 or more miles out. In reality, controllers try to keep them at similar altitudes, so step downs are not uncommon—first to FL240, then to 11,000. ORD then typically descends them to 7,000' until they pass abeam ORD on downwind, then they’re cleared down to 4,000. Once the flights are turned onto the final approach course, they are free to descend on their own on the glide path which takes them down to field elevation. Here’s how I saw it: once the diamond four got somewhere around 40 miles out, the approach controller could take flights 2 (left flight of the middle pair) and 4 (Tail end Charlie, or “the Slot”) and start them out on that 010 or 020 vector. As they diverged from the other flight, the controller could then turn 1 (lead) and 3 (right flight of the former middle pair) on a similar heading. 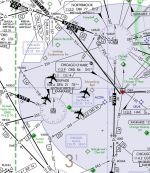 These two flights of two are now aimed for a point about twenty or so miles northwest of ORD, pretty much the standard vectoring pattern for that approach. As a result of that initial vector, and because of the geometry of the flight(s), 1 and 3 are now in-trail, as are 2 and 4. As the two flights get farther apart (and closer to the approach course), the controller turns #1 on to the approach. He then turns #2 on to the approach, creating about a ten or so mile gap between 1 and 2. He turns # 4 on to the approach (still Tail end Charlie), and then at the opportune time, turns #3 on in the gap between 1 and 2. 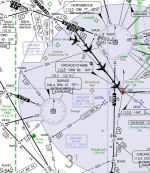 Hitting gaps like that is the bread and butter of arrival controllers, so rather than being a complicated tangle of airplanes, it was actually an elegant setup for an easy resolution. Sadly, the ORD guy wore bifocals. No matter. As I tried to teach all my trainees, always leave yourself an out. My out was make #1 go fast (he’d probably been operating with that instruction for a couple of hundred miles), slow #4 to 250, turn #3 out a bit (away from the airport), turn #2 out behind #3 and in front of #4, probably with a little speed adjustment, as well. Then, after turning 3 and 2 back in, let #4 go fast again if he wanted to. More effort than necessary if working with a visionary, but simple enough as a solution at hand if not. I can’t completely fault the ORD guy, as he, no doubt, would not expect a setup like that from a center guy. Given that expectation, it’s not a surprise that what appeared to me an obvious solution wasn’t first on his list of resolutions. It all worked out then and now I have a good story to tell which reveals some of the inner workings of ATC. Thanks to my friend, Dave, for resurrecting this tale. He tells me it was a teachable moment for him as he had not been exposed, to that point in his career, to terminal type thinking which was “out of the box” for a high altitude guy.